Save Loads of Cash on All Gas and Electric Water Heater Repair, Replacement, and Installation Services in Irvine, CA. Water heaters make life convenient, but when they fail they can lead to frustration and financial worries. Electric and gas water heaters fail at the worst times and when you least expect it. This is why Irvine Plumbing and Rooter Pros is available 24 hours a day, seven days a week to provide immediate, emergency services in Irvine, CA. Our technicians are on-call and standing by ready to offer professional assistance with any electric or gas water heater tank repair or replacement you need today. Do not let amateur contractors mess with your water heater repair issues. Instead, put your water heater repair and replacement needs into the hands of trained technicians that are the best of the best. Every Irvine Plumbing and Rooter Pros technician is mandated to receive continuing education on an annual basis. Our technicians receive over 100 hours of additional, yearly training to ensure that they are using the best methods and the latest equipment to ensure that repairs and installations exceed industry standards. No other plumbing company in Irvine can match the expertise of our contractors. Not only do we deliver superior service, but we take pride in our up-front pricing policy. At Irvine Plumbing and Rooter Pros, we save you money by billing for our repairs by the job instead of at an hourly rate. Whether you have a gas heater or an electric water tank, you can be confident that you won’t receive any unwanted surprises when you receive your final bill. The initial quote you received is the actual price you will pay for service. At Irvine Plumbing and Rooter Pros, we don’t discriminate. 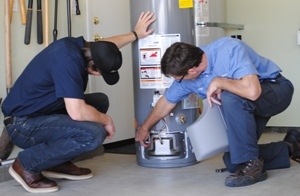 Our technicians receive superior training to make repairs to all types of water heaters from tankless water heater repair to gas water heater installation and much more. When you need hassle-free, friendly, and skilled repairs, give us a call or schedule a service call online. We make it easy for our customers to get the repair services in Irvine, CA, that they need most. Our technicians can also help you with faucet repair, toilet installation, and so much more. Get in touch with us today to find out why we’re the #1 residential plumber in Irvine.